When she was just 19 years old, Valerie Taylor had a terrible car accident that injured her pancreas eventually leaving her to battle Diabetes. Now, at forty-five years old Valerie is in End Stage Renal Failure, on dialysis, and in desperate need of a life-savings kidney transplant. Valerie is a single mom with two children, Malen and Joshua Kale that she loves dearly and whom love and need their Mom. You may know Valerie from Mercy Hospital where she worked as a Unit Secretary/CAN or from the Johnston County Sheriff’s Department where she served as a 911 Dispatcher for several years. Valerie also worked part-time for the Family Shelter of Southern Oklahoma helping families fight against domestic violence. You may have met her at Durwood Baptist Church where she and her family attend. After many years of helping others, Valerie is now the one who needs our help. Transplants, while life saving are very expensive. Even with insurance, there are many out-of-pocket expenses including co-pays, travel expenses for pre transplant and post-transplant testing, and the costly anti-rejection medications that Valerie will have to take for the rest of her life. 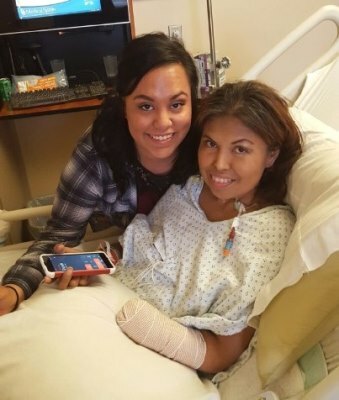 To help with the financial burden of Valerie’s uninsured expenses, a fundraising campaign in her honor has been established with HelpHOPELive, a trusted nonprofit organization that has been providing community-based fundraising guidance to patients and their families for more than 30 years. All donations are tax-deductible, are held by HelpHOPELive in the South-Central Kidney Transplant Fund, and are administered by HelpHOPELive for transplant-related expenses only. Please consider making a contribution. Your support is critical to the overall success of Valerie’s struggle. Please know that your contribution counts. On behalf of Valerie and her family, we thank you in advance for your kind consideration. Thank you to Adreienne Taylor, Chris Hughes, Eileen Hughes, Arlene Austin,J. Morgan, Donald Gannon and everyone for your donations and messages of support. They mean so much and give me hope. Sending prayers to you my dear cousin. I know we haven't been closed but please know that you are in my thoughts. You are the strongest most caring person and have such a huge heart for people. You are a great mom and always think of other peoples feelings before putting yours first. I am so lucky to have you as my sister! You are so hilarious and always make everyone smile and definitely laugh for sure! We are all going to help you get through this difficult time. You are always in good spirits when I see you and have a funny story to tell, EVERYTIME!! We all love you and God will answer all our prayers and take care of you. God bless you sister, and always keep the faith. I hope reading this will put a smile on your beautiful face! Lots of love always from all of the family! !